Hopefully you remember Isis - the mobile payment initiative that AT&T, T-Mobile and Verizon started last November. It is a partnership with Discover and Barclays to create a payment network that tackles the juggernauts Visa and MasterCard by introducing NFC payments with your phone, and carrier billing for purchases. We haven't heard much about the venture, named after an Egyptian goddess of fertility and magic, since its announcement. That doesn't mean that the carriers and their banking partners have not been hard at work on the pilot project. 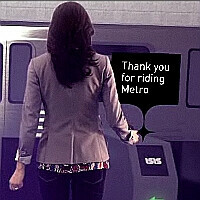 It launches in early to mid-2012 in Salt Lake City, of all places, and Isis has signed up the entire Utah Transit Authority, enabling passengers to ride the metro by just waving their smartphones before the terminal. "The Isis system will evolve to offer customers a highly secure and convenient way to pay, redeem coupons and store merchant loyalty cards, all with the tap of their phone. ", says the press release. The mobile payment partnership is also working with the Salt Lake City Chamber and various local merchants on the project. While ten years behind Japan in respect to mobile payments, the battle for who will take the hard-earned cash out of your wallet in the most convenient way is heating up, and it will be interesting to see what phones the carriers have in mind for the NFC trials. As far as we know, only the Nexus S, and the Nokia Astound have built-in NFC chips for now. Most new BlackBerries will also come with the ability preinstalled, according to RIM, and the next iPhone will almost certainly feature an NFC chip as well. Sprint is creating its own mobile wallet program called Wave and Pay, to be launched by year-end, and Google partnered with MasterCard, Citigroup and Verifone on NFC trials for San Francisco and New York. Whether we want it or not, NFC mobile payments will certainly become a part of our everyday lives very soon. For more information on the various ways to use the NFC chip in your mobile phone, you can read our article here.